"Scratchings" redirects here. For the DJ technique, see Scratching. Pork rind is the culinary term for the skin of a pig. It can be used in many different ways. It can be fried or roasted in pork fat (lard) to produce the snack called pork rinds in American English and pork greaves, pork scratchings, or pork cracklings in the UK (although "crackling" may instead refer to the rind on a roasted pork joint). The frying renders much of the fat attached to the uncooked rind, causing the size of the cooked product to be reduced considerably. Often a byproduct of the rendering of lard, it is also a way of making even the tough skin of a pig edible. In many ancient cultures, animal fats were the only way of obtaining oil for cooking and they were common in many people's diets until the industrial revolution made vegetable oils more common and more affordable. Microwaveable pork rinds are sold in bags that resemble microwaveable popcorn and can be eaten still warm. Pickled pork rinds, though, are often enjoyed refrigerated and cold. Unlike the crisp and fluffy texture of fried pork rinds, pickled pork rinds are very rich and buttery, much like foie gras. For the large-scale production of commercial pork rinds, frozen, dried pork skin pellets are used. They are first rehydrated in water with added flavoring, and then fried in pork fat at 200–210 °C (392–410 °F). Cooking makes the rinds expand and float on the oil surface. The rinds are then removed from the fat, flavored, and air dried. Antioxidants may be added to improve stability. Like many snack foods, pork rinds can be high in sodium and fat; however, they are low in carbohydrates and are sometimes considered an alternative snack food for those following the Atkins diet. According to Men's Health, a one-ounce (28 g) serving contains nine times the protein and less fat than is found in a serving of potato chips, which are much higher in carbohydrates. They add that 43% of pork rind's fat is unsaturated, and most of that is oleic acid, the same healthy fat found in olive oil. Another 13% of its fat content is stearic acid, a type of saturated fat that is considered harmless because it does not raise cholesterol levels. A 60 g serving of pork rind contains 29 g of fat, 375 kcal and 0.65g of sodium. However, pork rinds are considered an incomplete source of protein because they contain very low amounts of some essential amino acids, including methionine, tryptophan, and histidine. Torresmo, also known as toicinho de porco, is a popular bar snack in Brazil, usually served in bite-sized chunks. It is also a common accompaniment to typical dishes such as feijoada and virado. Chicharrones is the term for pork rinds in Colombia. Two kinds of chicharrón exist: chicharrón toteado (exploded pork crackling), which has no meat in it and is similar to the lighter, commercial version, and chicharrón cocho, which is usually made with part of the pork meat attached to the skin. This makes for a crispy skin and a soft, juicy meat. It is traditionally served with beans, rice, fried eggs, avocado, and plantain in a typical plate called bandeja paisa. Scrunchions is a Newfoundland term for small pieces of pork rind or pork fatback fried until rendered and crispy. They are often used as a flavoring over other foods, such as salt fish and potatoes, and mainly used as a condiment for fish and brewis. In Quebec, they are often called oreilles de Christ (Christ ears) and are eaten almost exclusively as part of traditional cabane à sucre meals. Chicharrones are commonly served in homes or snack in bars and restaurants, little sodas (small restaurants with home-cooking flavor business) also adds in their menu Vigoron or empanadas with chicharrones and famous snack dish called chifrijo. Preparation could change from using pig fat as base, boiling and later frying, but many prefer using a wok-like pot and wood-fire cooking. Mexico is one of the world's largest producers and consumers of pork rinds, known as chicharrón or chicharra. It may still have fat attached, called in Spanish chicharrón con gordo in central México. It is commonly served in homes across Mexico. It can be served in a soup sometimes called chicharrón con chile (pork rind with chili sauce) or salsa de chicharrón (pork rind sauce). It is often served as an appetizer, or even offered as snack at family reunions. However, chicharrones can be purchased on the street and are usually eaten with hot sauce and lime juice. One popular breakfast is salsa de chicharron, (also chicharrón con chile or just chicharrón in some regions) cooked in green tomato or tomato salsa spiced with epazote. If liquid is drained, the pork rind can be used in tacos, either as fast-food products or kitchen made. The dryness in pork rind pairs perfectly with humidity and softness in pico de gallo (diced tomato, avocado, onion, cilantro [coriander leaf], and chili mix) and both fill perfectly a corn tortilla as taco. A byproduct in frying rinds is the decanted residues in fryer called asiento or boronas (grounds). The process requires uniformly cooking rinds, and while the product dehydrates, it cracks, losing small pieces, which are collected afterwards and become a thick, fatty salsa, that can be mixed as an ingredient in other salsa de chicharrón recipes or used for its flavor and fat in pan frying. A second byproduct in frying rinds is lard. Cueritos are the same as pork rinds, but are soft, chewy, and translucent, as they are not heavily cooked unlike the chicharrón, which is very crispy. They are easily available in Mexico as antojo and sold on the streets, usually by butchers, oftentimes served fresh, but one can also find them marinated with vinegar and onion at tienditas, popular convenience stores where the clerk is usually the owner. If marinated, they are served with lemon and salt, powdered chili and probably with salsa Valentina. In the Yucatan cuisine, it is often served along pork belly, known locally by the Maya word kastakán, blood sausage, and a spiced sausage made from pork entrails and habanero peppers known as buche. A selection fried pork skins and pork cracklins at a local Winn-Dixie in Florida. Pork rinds, sometimes cracklings, is the American name for fried or roasted skins of pigs, geese or other animals, regardless of the status or amount of pork in the snack. Pieces of fried meat, skin, or membrane produced as a byproduct of rendering lard are also called cracklings. Cracklings consist of either roasted or fried pork rind that has had salt rubbed into it and scored with a sharp knife: "a crackling offers a square of skin that cracks when you bite into it, giving way to a little pocket of hot fat and a salty layer of pork meat." Cajun cracklings (or "cracklins") from Cajun cuisine (called gratons in Louisiana French), are fried pieces of pork fat with a small amount of attached skin, flavored after frying with a mixture of peppery Cajun spices. Pork rinds normally refers to a snack food commercially sold in plastic bags. They are made in a two-step process: pork skin is first rendered and dried, and then fried and puffed. These are also called by the Spanish name, chicharrón, a term from Latin America. Pork rinds sold in the United States are occasionally stained with a pink or purple spot. These edible marks are actually USDA stamps used on the skins to mark that they have been inspected. They are not harmful. In 2003, sales of pork rinds experienced rapid growth, but they have dropped "by $31 million since 2004, when they reached $134 million, and now make up barely more than 1% of the salty snack market." "脂渣" (zhizha) is made from pork, and are extremely popular in and only popularized in Qingdao, Shandong. It is a byproduct of lard. Lard is usually sold around US$1, but zhizha may be sold for about $30-40 and huazhi for around $10 "精肉脂渣" (zhizha): The skin is removed and sliced as thin as a gold coin. After the extraction of lard, the rest is hard and tastes like a salty cracker, seasoned with salt and MSG while it is hot. "花脂" (huazhi): This is made from intestines, chopped and deep-fried twice, and used in stew or soup. Chicharon (derived from the Spanish chicharrón; also spelled tsitsaron) is usually bought from balut vendors as pulutan (i.e. appetizer dishes usually eaten with alcoholic beverages). It is also available in grocery stores, supermarkets, outdoor markets, sidewalk food vendors, and sari-sari stores (small, home made stores). Chicharon is prepared by deep-frying dried pork rinds and seasoning with salt. It is usually eaten with vinegar, hot vinegar (chopped chilies and/or soy sauce are added), or with bagoong, lechon liver sauce, or atchara (pickled green papaya). Chicharong manok, which is made from chicken skin, and chicharong bulaklak (literally 'flower chicharrón', from its distinctive shape) made of pig intestine, are also popular. It is also used as a topping for pancit palabok and pancit malabon and in preparing pork sisig. Khaep mu (in the bowl at the bottom of the image) served as one of the starters in this selection of northern Thai dishes. Khaep mu (Thai: แคบหมู, pronounced [kʰɛ̂:p mǔː, kʰɛ́p mǔː]), as crispy pork rinds are known in Thai cuisine, are a speciality of the northern Thai city of Chiang Mai. One way of making khaep mu is to first cure the pork skin, with an attached layer of fat, in salt for several days, after which it is soaked in water for a couple of hours. This ensures that the fat cells will expand, resulting in a "puffed skin" after cooking. The slabs of belly fat are then slowly cooked at low heat in, preferably, lard but other animal fat and vegetable oil can also be used. Similar to a confit, the pork thus treated can be stored. The pork is then cut into smaller pieces and baked in an oven until perfectly crispy. Another method of making the pork rinds again involves salting the pork skin, but instead of soaking it, the skin is hung out to dry in the sun after which it is sliced and deep-fried twice. Yet another way to make this dish in Thailand is to first cut the pork skin into strips, then boil them in water after which they are thoroughly dried before being deep-fried. Northern Thai people most often eat pork rinds together with different Thai chili pastes, such as nam phrik num (made with grilled green chili peppers) and nam phrik ong (made with dried chili peppers, tomato and minced pork). It can also be eaten as a snack, either on its own, or with nam chim khaep mu, a dipping sauce made with lime juice, fresh chili peppers and a sweet chili paste. It can also figure as an accompaniment to Thai dishes such as Nam ngiao and the famous Thai salad som tam or used crushed as an ingredient, for instance in sa makhuea, a northern Thai salad made with minced pork and Thai eggplant. Pork rinds used to be a very common food in Vietnam before the Doi moi program in 1986. Due to various economic difficulties in the pre-Doi moi era, cooking oil and meat were still considered "luxury goods", and consequently fat liquid and pork rind became excellent replacements in Vietnamese daily meals. Nowadays with a better economic situation for the country, pork rind is no longer a substitute food, but rather a special component in many Vietnamese dishes, such as cơm tấm, noodle and snails (bún ốc), noodle soup, etc. In Vietnamese, pork rind is called tóp mỡ, which translates to "dried piece of fat". In most Slavic countries they are known as "škvarky" (as in the Czech Republic and Slovakia), "шква́рки" (as in Russia or Ukraine), or " Čvarci" (as in Serbia or Bosnia). Often they are mixed with lard as a type of spread, and served with bread. They are particularly popular in this form during celebrations when alcohol is to be consumed. They are part of the traditional dish "bramborové knedlíky se škvarkama a kyselým zelím", potato dumplings with cracklings and sauerkraut. See the picture. In Hungary, they are called "tepertő" and is usually served with salt and bread, sometimes vegetables. It's consumption is at its peak during the season of pig slaughter, as it is then when pork rind is at its freshest. It is usually consumed as breakfast or dinner meal. In Romania they are known as "jumări". The outer layer of a pig's skin, known as "șorici", is usually served with salt and cut in thin slices of a few millimeters. In Catalonia, a llardó is each of the pieces of fried animal fat (specially of pork) that remain after pressing to extract the lard, so that they are golden and crunchy. They are sold by weight in salumerias in Catalonia, and in the Carnival time they are often also found in pastries. The llardó is used as an appetizer, as a snack, and is essential to make the coca de llardons, a cake typical in Catalonia during different festivals. Some salumerias use them to make egg butifarras, since in Barcelona both products are strongly associated to Fat Thursday. 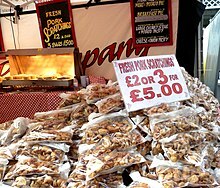 Pork scratchings is the British name for deep-fried, salted, crunchy pork rind with fat produced separately from the meat. This is then eaten cold. Pork scratchings typically are heavy and hard, have a crispy layer of fat under the skin, and are flavored only with salt. The pig hair is usually removed by quickly burning the skin of the pig before it is cut into pieces and cooked in hot fat. In comparison, Crackling is distinguished from normal pork rind in the United Kingdom by the fact that it is cut from a freshly-roasted joint of pork (Usually a Pork loin or Pork chops) after the meat has finished cooking and is usually served warm or hot, before the fat on the underside of the roasted skin can finish cooling down and re-solidifying. Pork scratchings are sold as a snack food, and common brands include Mr. Porky, Big D, Uncle Albert, Jays, and Midland Snacks. Unlike the physically large, but relatively light bags of deep-fried skin without the fat sold around the world, in the UK they are sold in relatively small bags which usually weigh between 42 g and 90 g. and are eaten as an accompaniment to a pint of beer in a pub, just like crisps or peanuts. Scratchings can also be bought from butchers, supermarkets or newsagents. They have been taken to both the North and South Poles on various expeditions, because of their high energy content. There are three distinct types. Traditional scratchings are made from shank rind and cooked just once. Pork crackling is also made from shoulder rind, but is fried twice. It is first rendered at a low heat, and then cooked at a higher temperature for a less fatty, crispier result, or cut from roasted pork joints to produce heavier but less fatty results. A more recent development is the pork crunch, which is made from back rind and again double-fried to become a large, puffy snack. Some supermarkets now sell just the layer of skin and fat (no meat), in a raw form for home grilling or roasting, or cooked and ready to eat from hot food counters. The term "crackling" is also often applied to a twice-cooked variety of pork scratchings. Krupuk kulit, a similar Indonesian snack but more commonly made from cattle skin. ^ "History of pork scratchings". Freshers Foods. Archived from the original on 9 December 2012. Retrieved 1 November 2012. ^ Edmund W. Lusas; Lloyd W. Rooney (5 June 2001). Snack Foods Processing. Taylor & Francis. pp. 421–. ISBN 978-1-56676-932-7. Retrieved 7 July 2013. ^ "Hands off my pork scratchings: They're a heart attack in a bag – but it's time the food police laid off my favourite snack". Daily Mail. London. ^ "scrunchins n pl". Heritage.nf.ca. Archived from the original on 3 June 2013. Retrieved 21 September 2012. ^ "Canadian Food Words by Bill Casselman sample page two". Billcasselman.com. Retrieved 21 September 2012. ^ Janer, Z. (2008). Latino Food Culture. Food Cultures in America (in Italian). ABC-CLIO. p. 114. ISBN 978-0-313-08790-5. Retrieved 30 July 2016. ^ Eve, Zibart "Ethnic Food Lover's Companion: A Sourcebook for Understanding the Cuisines of the World"
^ a b c Severson, Kim (2 February 2010). "For the Big Game? Why, Pigskins". The New York Times. Retrieved 3 February 2010. ^ Zeldes, Leah A. (12 May 2010). "Eat this! Chicharron, mighty meaty crunch". Dining Chicago. Chicago's Restaurant & Entertainment Guide, Inc. Retrieved 22 May 2010. ^ "Since 1919 – When The Chips Are Down, Be Sure They're Husman's | Husman's Snacks". Husmans.com. Retrieved 21 September 2012. ^ "Fried Pork Skin « Traveling Chili". Travelingchili.com. 3 August 2012. Retrieved 21 September 2012. ^ Hsiao, Tina (14 October 2011). "Chiang Mai cuisine: The city's top snacks and curries". CNNGo.com. Retrieved 21 September 2012. ^ "Crispy Puffed Pork Rinds แคบหมู (Kab Muu)". Ediblyasian.info. 11 March 2011. Retrieved 21 September 2012. ^ 2Kauhiwai (21 April 2010). "Kaeb Moo – fried pork rind HD.mov". YouTube. Retrieved 21 September 2012. ^ a b "Thai Food: Fried Pig Skins (Cab Moo)". Joysthaifood.com. 29 September 2011. Retrieved 21 September 2012. ^ "ขอทราบ สูตรและวิธีทำน้ำจิ้มหมูหัน". Gotoknow.org. Retrieved 21 September 2012. ^ "::Sa makhuea-pro, Lanna Food, Thai Food, Thai Lanna Food, Food and Cuisine, Northern Thai Food, Herb, Thai Ingredient::". Library.cmu.ac.th. 14 June 2007. Retrieved 21 September 2012. ^ "Bún ốc tóp mỡ ngõ Mai Hương". Bưu điện VN (in Vietnamese). 14 January 2011. ^ Thu Hường (28 April 2011). "Lạ miệng tóp mỡ "cặp kè" bún ốc" (in Vietnamese). ^ Severson, Kim (2 February 2010). "For the Big Game? Why, Pigskins". The New York Times. Retrieved 7 October 2010. ^ "Pork Scratchings taken to both North and South Poles – Scratchings sale to bring home the bacon". Retrieved 6 April 2009. ^ "Rind of the Times". The Independent. London. 22 June 2004.